Pray that they never sacrifice their family for ministry since their family is ministry. Pray for them to prepare for Sunday by focusing on worship as primary and music as secondary. Pray that they will help us focus more on the creator and less on their creativity. Pray that Scripture and Prayer instead of song selections frame their worship preparation. Pray for healthier ministry staff relationships. Pray that their days off and vacations provide rest that is free from church responsibilities. Pray for their spiritual, physical and emotional health. Pray that they’ll be able to sift through the many responsibilities that compete for their attention and focus on the ones God wants them to do. Pray for them to wake up every morning feeling unqualified in their own power to do what God has called them to do. Pray for them to daily recommit to their call here instead of dreaming about what it might be like to be there. Pray they never confuse leading music with leading people. Pray for them to have enough humility to engage us as participants instead of audiences. Pray for the protection of their marriages. Pray for trusted leaders to hold them accountable and protect them. Pray for their almost insurmountable task of trying to stay current musically, technologically and culturally. Pray for a great cloud of witnesses to surround them so they can fix their eyes on Jesus and run with endurance. Pray that they will have the courage to ignore the loudest voices if not God’s. Pray for their wisdom to select old and new songs that will help us respond to God’s revelation with biblical, theological and doctrinal integrity. Pray that they will have patience and persistence when it seems like none of us are completely happy with their musical selections. Senior adults are probably not as averse to church change as much as they are to feeling marginalized through those changes. Their opinions are no longer needed or considered and their convictions seem to be overlooked as antiquated. I can imagine some seniors view change as building a wall to separate what was from what will be. It appears that the price paid through their years of blood, sweat, tears and tithes is now being used to build a wall that will sideline or keep them out completely. When your horse dies…stop riding it may be a great adage to challenge congregations attempting to reach an ever-changing culture with never changing practices. But it doesn’t offer much comfort for the pain and grief of those who loved the horse. Change is sometimes necessary when a church considers the culture and context of those present and those not present yet. But in an effort to initiate change, some congregations push to do anything different than what was done in the past. Congregations often change their worship and discipleship styles and structures without ever evaluating their existing people and practices. That lack of planning and reflection can often cause unnecessary transitional pain as a result of the depreciation of what was. Since change is often essential in order for churches to progress, the automatic assumption is it will always require incorporating something completely new. It is possible, however, that the only new necessary for congregational health and growth is to do what you are already doing…better. Chip and Dan Heath wrote, “We rarely ask the question: What’s working and how can we do more of it? What we ask instead is more problem-focused: What’s broken and how do we fix it?” Maybe the change most of our congregations actually need is not a revolution but instead a reevaluation. A reevaluation, however, considers or examines something again. Reevaluation allows a congregation to consider change by rethinking, revisiting and reinvestigating. It systematically and selectively preserves valuable elements for re-use. Most of us like to blow things up, so our initial response when things don’t seem to be working is to completely destroy existing practices for the prospect of future success. Maybe a reevaluation instead of a revolution would allow us to tear down those walls between our generations. And maybe church change conversations should begin with how we can prayerfully add to rather than arbitrarily take away. 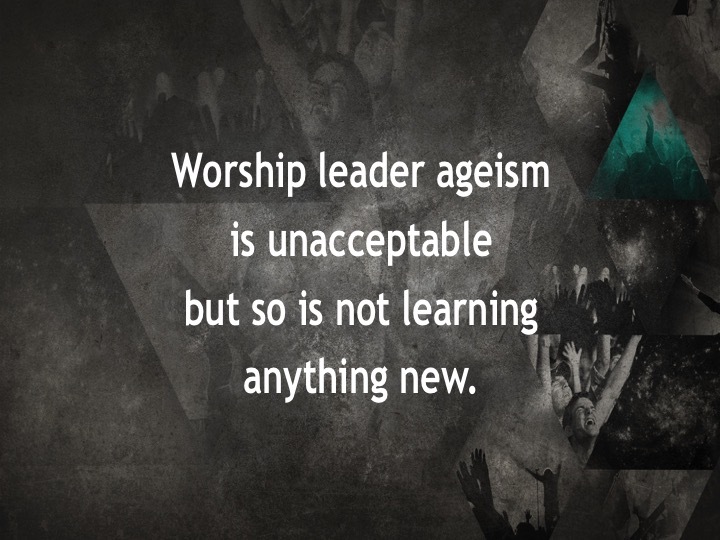 Ageism has impacted or probably will at some point impact most of us serving in worship leadership. Churches seem to be on the lookout for a younger platform presence or fresher image from those who lead. Forced termination or demotion as a result of the ageism epidemic reminds us that where we serve is not always ours to control. What we can control, however, is that we are prepared to continue to serve even if it is no longer here. So what if we find ourselves only prepared to lead a ministry that no longer exists? What if what we once learned is not enough to sustain us through our entire ministry? What can we do that will allow us to continue? Extend Your Shelf Life – Shelf Life is the length of time items are given before they are considered unsuitable for use or consumption. It is the time in which the defined quality remains fresh, acceptable, viable, usable and effective under normal or expected circumstances. Increasing our shelf life encourages us to recalibrate or fine tune for the potential of a new reality. It necessitates a rededication or recommitment to our base call to ministry instead of focusing solely on our present position. And it often calls for a reboot or restart that will reawaken our drive. Get A Real Job – What if you were asked to step aside from worship ministry and opportunities were no longer available for you to lead worship full or even part time? Some of us have found ourselves in a similar situation only to realize we aren’t trained or training to do anything else. Getting a real job means we are prepared vocationally to take care of our family and financial needs even if we need to step aside from leading worship. Learning additional marketable skills either inside our outside the church doesn’t compromise our calling. In fact, retooling can enhance that calling by expanding our influence beyond choirs and chord charts. Agreeing that worship ministry ageism is unjust or theologically suspect doesn’t change its reality. So we can choose to live in a constant state of lament or we can proactively prepare in case it does occur. Like the third rail, how we approach ageism has the power to propel or terminate our future ministry. For married worship pastors: How often do I have a “date night” with my spouse? For single worship pastors:Do I spend time with friends or family members on a regular basis? How often do I engage in physical exercise lasting at least 30 minutes? Am I heavier than my recommended weight? Pastor, Could You Work For You? opinions different from yours were seen as disloyalty? collaboration meant everyone just listened to and implemented your ideas? shared ministry threatened your control? your ministry initiatives were always the non-negotiable ones? you never owned any deficiencies contributing to staff relationship issues? your leadership default was autocracy instead of advocacy? you were a gatekeeper instead of a liberator? you had outgrown the need to learn anything new? other ministries were seen as competition instead of complementary? all other ministries were evaluated except for yours? friendship with other staff members was not an option? you considered yourself as the only one qualified to lead? you wouldn’t work with others because they work for you? your expectations were assumed but never clarified until they were unmet? Leading a ministry culture of healthy communication and collaboration requires a level of sacrifice and trust that cannot be guarded, territorial, defensive or competitive. It publicly and privately acknowledges the calling and competence of others and is not afraid of transparent dialogue. And it openly embraces and shares unified goals and the responsibilities for fulfilling them. Pastor, don’t you realize what you are missing by disregarding intentional, significant conversations about vision, hopes, dreams and goals? Aren’t you longing for staff relationships built on trust, loyalty, respect and friendship? Wouldn’t you love to pray and plan together with ministry teams as partners instead of puppets? How fulfilling could it be to minister in a place that constantly conveys an attitude of mutual spiritual and relational development with no ulterior motive? It is never too late to realize that the final word doesn’t always have to be yours. When that occurs your ministry relationships and your church will never be the same. Learn more people’s names than new songs. Take a Sabbath every week. Make deposits in younger leaders and withdrawals from older leaders. Pray for and defend your pastor even when he doesn’t deserve it. Leave more things at the office when you go home. Ask how it might impact your family before asking how it might impact your job. Learn more theology than musicology. Welcome divine interruptions in your routine. Surround yourself with those to protect you from your own stupidity. Place more focus on people than projects. Celebrate the Lord’s Supper more often. Begin all worship planning with Scripture and Prayer instead of songs titles. Drink more coffee with senior adults and students. The original song key may not be the best key for congregational singing. Practice leadership as much as you practice your guitar. Not all thoughts that enter your mind have to exit your mouth. Don’t feel threatened when someone else gets the credit. Affirm volunteers in public, correct them in private and pastor them in both places. Don’t randomly blow things up without considering where the pieces might land. Help grandparents and grandchildren worship together. If you don’t guard yourself spiritually, emotionally and physically no one else will. Public worship will never succeed without private worship. Understand the difference between knowing you can and deciding you should. Build bridges from the platform to the pews. Turn house lights up and volume down occasionally to see if they are even singing. Don’t determine the worship language of your congregation based on how you might appear to other worship leaders. 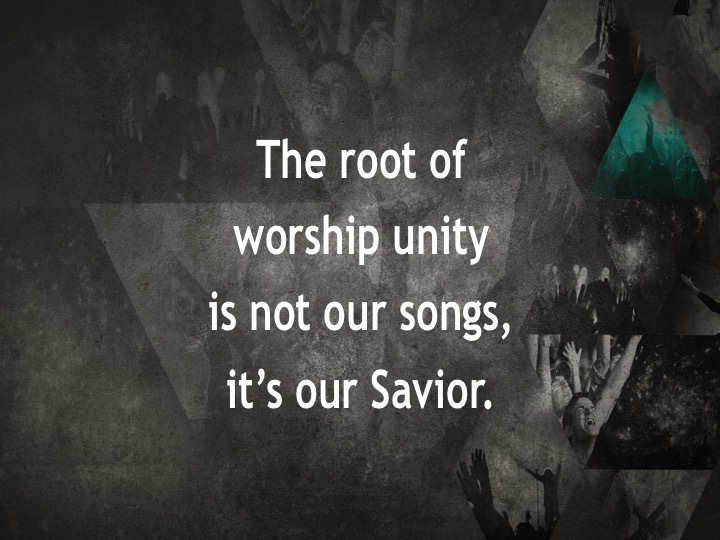 You’ll always sing too many or too few hymns or modern worship songs for someone. Filter songs theologically before musically. Wake up every morning feeling unqualified in your own power to do what God has called you to do. Keep your focus on where you are instead of where you wish you were. Spend as much time on relationships as you spend on ministry job placement sites. Not all staff problems originate in someone else’s office. There are lots of other churches but you only have one family. Your attitude may be the only change necessary. Scripted, explainable and rational aren’t always worship prerequisites. If you try to succeed alone you’ll also fail alone. Setting boundaries ahead of time gives you the resolve to say no. What you once learned is not enough to sustain your entire ministry. The worship service you prepared may not be the most important worship that occurs this week. Just changing the music won’t grow or kill your church. Not every worship song is appropriate for congregational singing. Leading music doesn’t necessarily mean you are leading people. 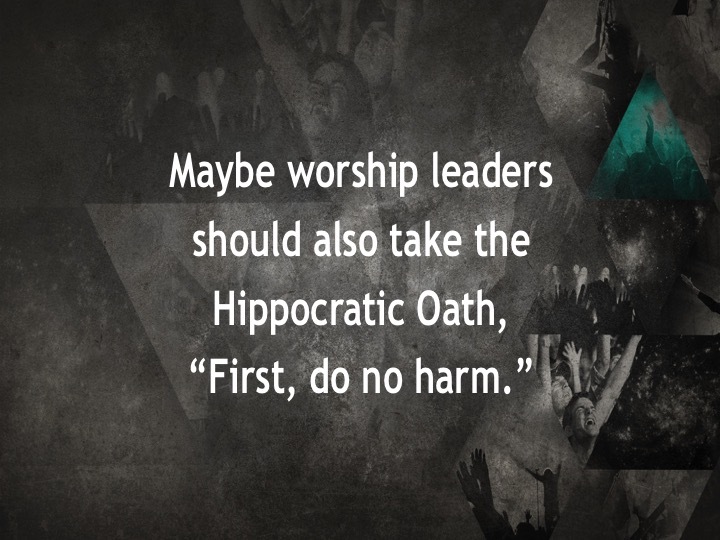 Worship even when you aren’t the leader. 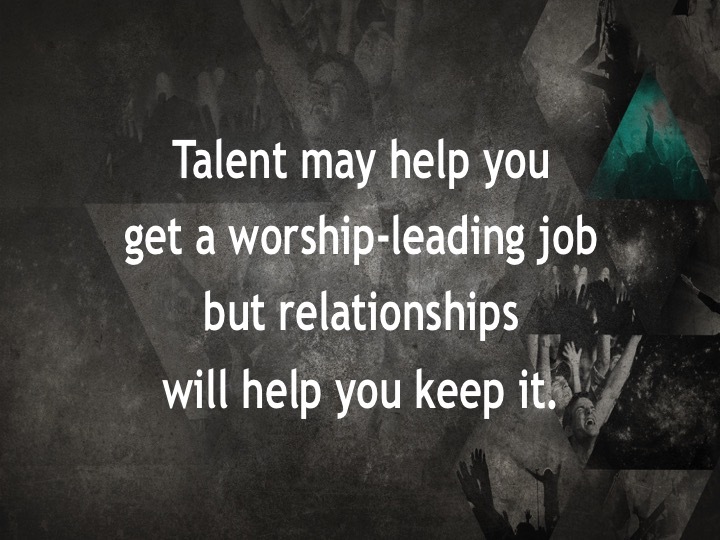 Your musical talent may help you secure a position but leadership and relationships will help you keep it. Don’t lead worship just because you don’t know how to do anything else. If you’re saving your best for where God might call you next, why would He want to? Worship Pastor Prayer: Give Me Jesus! Worship Leaders Need To Give It A Rest! If you’ve flown on a commercial airline you have undoubtedly heard the flight attendant recite the following pre-flight safety instructions: “In the unlikely event the oxygen level in the main cabin becomes unstable, oxygen masks will drop in front of each passenger.” Passengers are then instructed to secure their own masks before assisting other passengers. Sunday is the day designated each week by most congregations as the Sabbath or day of rest. As a worship leader, your Sabbath has evolved into a day full of services, rehearsals and meetings. At the end of the day your spiritual, emotional, mental and physical resources are usually completely depleted. Someone once said that Sunday for those in ministry is like giving birth only to realize on Monday morning that you are pregnant again. So since Sunday is obviously not a Sabbath for you, when are you taking one? Maybe the more telling question is are you taking one? If not, how can you expect to lead people to a place you no longer have the stamina to go yourself? Worship Ministry has the tendency to sanctify busyness rather than free us from it. We have developed worship leading cultures that value motion as a sign of significance. We lead those cultures as if our efforts are essential to God’s success in His mission to the world. Several years ago, David Henderson wrote an article titled Take A Load Off: Are You Doing More than God Intended? Based on the previous Matthew passage, Henderson suggested that we could lighten our load by stripping off our self-made yokes, by laying aside the things God has not called us to and by asking God to lead us into each day. Observing a Sabbath is saying yes to God and his rhythms and no to the life-draining rhythms of the culture and people around us – it is essential to our call to worship. So if we as leaders aren’t modeling Sabbath rest for our congregations, who is? Mark Labberton, The Dangerous Act of Worship: Living God’s Call to Justice (Downers Grove: InterVarsity, 2007), 96. In his search for the roots of violence, Mahatma Gandhi drafted a list to give to his grandson titled the “Seven Blunders of the World.” Number seven was Worship without Sacrifice. Paul used this image of the body to represent the whole person, including ideologies and preferences. Living sacrifice signifies an ongoing, constant, all-inclusive submission. To sacrifice is to surrender for the sake of something or someone else. It is the act of giving up, offering up or letting go. The antonym of sacrifice is to hold on to. A bunt in baseball is designated as a sacrifice for the purpose of advancing another runner. Executing this sacrifice is called laying down a bunt. What a challenging word picture for the church as it gathers together in communal worship. Lay down their preferences because they love those with whom they worship more than they love those preferences. Acknowledge that worship did not begin and will not end with the worship preferences of their generation. Admit it is arrogant to assume their favorite worship and God’s favorite worship are the same. Humility is one of the most difficult qualities for worship leaders to embrace and sustain. It is always a challenge to be both up-front and unassuming. In the name of artistic excellence we are often unwilling to take a secondary and supportive role to those who are obviously less talented. Instead of a desire to be recognized, revered or elevated, maybe our worship leading prayer should be instead, “Lord, deliver us from ourselves.” Jorge Luis Borges wrote, “Arrogance is when the image of the Lord has been replaced by a mirror.” Setting our egos aside and placing others first models a level of worship leadership that platform presence will never achieve. Having enough humility to tap into the creative abilities of others in the planning, preparation and implementation of worship doesn’t diminish our worship leadership influence it actually enhances it. So when humble leaders leverage all available resources it is a sign of leadership strength, not weakness. So if you alone are holding onto the worship process as an arrogant gatekeeper to receive all the credit when something works, just remember that you alone will also receive all the credit when something doesn’t. Worship leadership is not what you do for or to your congregation it is what you do with them. A Lorica is a prayer recited for protection. This Latin word originally meant armor or breastplate. Knights would place verbal inscriptions on their shield or breastplate for recitation before going into battle. The Lorica of Saint Patrick, patron saint of Ireland is called St. Patrick’s Breastplate or the Deer’s Cry. The story is that Patrick recited this prayer to protect him and his followers as they faced persecution for sharing Christianity across Ireland. As the Celtic Christians chanted this prayer, it is said that the Druid’s waiting to kill them saw deer, not men. One of the best-known verses of St. Patrick’s Breastplate can also serve as a Lorica for us as we face the disappointments, grief, fear, doubt and hopelessness that any new year might bring. Even when my ministry position allows me to have the last word it doesn’t have to be mine. I can have a vision for future ministry without denigrating past ministry. If I hoard leadership to receive all the credit when something works, I will also receive all the credit when something doesn’t. Progress at the expense of relationships is not anymore virtuous when the goal is noble. Affirm staff and volunteers in public; evaluate them in private; and pastor them in both places. If you randomly blow ministries up, then you’ll never know where the pieces are going to land. My leadership is not threatened when someone else gets the credit. It is always a better outcome when I err on the side of grace. If I don’t take care of myself spiritually, emotionally and physically no one else will. Not all ministry staff problems originate in someone else’s office. People generated is always healthier than leader dominated. I should always surround myself with a group of trusted leaders to protect me from my own stupidity. There are lots of other ministries but I only have one family. The end of learning new is the beginning of leading old. Bullying is not more honorable under the pretext of pastoral leadership. I could learn about life and ministry by drinking more coffee with senior adults. My attitude may be the only change necessary in our ministry organization. Ministry success is based more on the in-betweens than the big events. Leadership equilibrium is achieved by making deposits in younger leaders and withdrawals from older leaders. Ageism has impacted the shelf life of those serving in ministry as churches look for a younger presence or fresher image in ministry leaders. Forced termination or demotion of leaders as a result of this epidemic reminds us the ministry shelf life where we serve is not always ours to control. Healthy church staffs embrace and share with each other the unified goal of fulfilling and helping each other fulfill the mission of their congregation. Unhealthy church staffs, on the other hand, function as independent contractors performing their own duties dependent only on their own strengths, abilities, methods, processes and talents. The Urban Dictionary defines Epic Fail as a complete and total failure when success should have been reasonably easy to attain. It is no wonder churches are struggling with ministry success when the church staffs that lead those churches can’t get along with each other. Ironically, their relational impasses seem to occur more often as a result of something they don’t do than something they intentionally do. Church staffs are not immune from the struggles of life such as depression, physical health issues, marital conflict, belligerent children and financial stress. If church staffs aren’t sensitive and willing to pastor their staff colleagues and families when they face those issues and others…who will? In fact, some of them don’t really even like each other. Scripture reminds us to love God first, then our neighbors as ourselves. The closest neighbors beyond their families should be the people with whom they serve on their church staff. No stipulation is offered in this passage as to whether the neighbor really deserves or has earned the right to be loved. And the command is not contingent on a reciprocal response. Praying that God will call your church staff colleague somewhere else is not praying for and with each other, it is selfishly praying for your own needs and wants. Praying for and with each other requires communication, vulnerability, honesty, trust, brokenness and selflessness. Praying for and with each other surfaces hurts, unmet expectations, personal needs, ministry goals, concerns and dreams. The result of praying for and with each other about things that really matter may initiate a change in attitudes, opinions, hearts and vision that could encourage a reciprocity of love that did not exist before. Shared ministry requires sacrifice, humility, investment and trust. It publicly and privately affirms the calling and competence of the other staff members. It is not guarded, territorial, defensive or competitive and doesn’t care who gets the credit. Shared ministry means even when your position calls for you to have the last word it doesn’t always have to be your word. Shared ministry encourages reading, studying and conferencing together. And it has enough confidence in the abilities and intentions of the other staff members to allow and offer lateral mentoring and coaching. Church staffs constantly encourage the members of their congregations to develop relationships of transparency, fellowship and community, yet never model those characteristics in their staff relationships. Those relational bonds exemplified by the Acts 2 church as they spent time together, had everything in common, broke bread in their homes and ate together with glad and sincere hearts is often completely foreign to some church staffs. In fact, enjoying each other by playing and laughing together may actually be the starting point for developing some of those previously listed relational epic fails. Jaywalking is an informal term commonly used in reference to a pedestrian who crosses a roadway outside the designated crosswalks or without considering signal lights or contextual restrictions. Impatience, intolerance, irritability or even a restless desire for change can cause a pedestrian to consider jaywalking. Although the goal of jaywalking may be logical, practical and even noble…to reach the other side by the quickest and most-direct route, the method might not always be prudent, permissible, wise or even safe. Effective worship leaders are those who embrace and constantly share the goal of worshiping and helping others worship in spirit and truth. The leader who takes short-cuts in order to accelerate the changes necessary to reach that goal without first considering if those they lead are following or even willing to follow is guilty of Worship Jaywalking. What might appear to be the quickest and most direct route may seem reckless to members of your congregation who have the same goals but are more comfortable taking safer routes. Ignoring signals of caution can create conflict, sabotage trust, leave those we lead in our wake and cause us to re-trace our steps. What was intended to expedite our route may in fact lengthen it. Impatience at the expense of relational buy-in is not any more virtuous when the goal is noble. Collaborative worship leaders look ahead with laser vision while still looking beside and behind to confirm buy-in from those with them and those still standing on the curb. That collaboration is only realized when leaders seek the counsel of congregants who are habitual crosswalkers just as often as they do the radical jaywalkers. Once your collective communications have indicated worship change is necessary, you must also learn how to move on in spite of those few detractors not willing to cross at any location at any time. Impeding those on the curb ready to cross who are unified in their calling to get to the other side can be just as reckless and unhealthy as worship jaywalking. Most church staff members crave healthy communication with and leadership investment from their pastor. But they don’t often have the freedom or job security to initiate a relationship that intimate. Consequently, determining vision and direction is often a trial and error process that discourages the staff members and frustrates the pastor. The willingness to implement a culture of healthy communication requires a level of sacrifice and trust that cannot be guarded, territorial, defensive or competitive. It publicly and privately acknowledges the calling and competence of others and is not afraid of transparent dialogue. And it embraces and shares unified goals. But healthy communication will never occur until the pastor is willing to initiate it. A collaborative spirit that sees their ministry as complementary, not competitive. An open line of communication giving them permission to disagree in private without fear of retaliation. For you to acknowledge and value their calling and gifts even when radically different from your own. Mutual approachability, availability and accountability. For you to affirm them in public; correct, instruct, coach and mentor them in private; and pastor them at all times. The willingness to work toward a common philosophy of ministry. Affirmation that shared ministry will not threaten but instead strengthen your leadership. Loyalty, trust, respect and friendship. For you to initiate significant conversations that include hopes, dreams, goals, expectations, plans, concerns and evaluations. For you to acknowledge that the sermon may not always be the most important event of the week. A sincere desire to regularly pray together, process goals together and learn together. 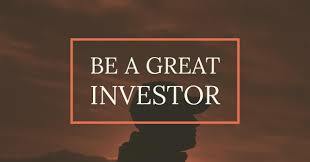 For you to invest in their personal and spiritual lives with no ulterior motive. Initiating worship change can be painful and at times even devastating. It can be just as devastating, however, when a congregation is hesitant to make those needed changes even when it is obvious they are necessary for their future. The fear of pain associated with change is never a good reason not to initiate it. Churches and their leaders rarely go through worship transitions unscathed. But scripture offers hope in the Psalms that can serve as a balm when you reach the other side of those changes. Swing wide the city gates – the righteous gates! you showed everyone what you can do. All of these Psalms are taken from Eugene H. Peterson, THE MESSAGE: The Bible in Contemporary Language (Colorado Springs: NavPress, 2002).